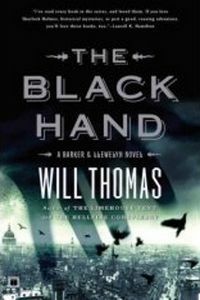 The Black Hand by Will Thomas, a Mysterious Review. Review: Private enquiry agent Cyrus Barker and his young assistant Thomas Llewelyn find themselves in the middle of a conflict between "families" in The Black Hand, the fifth mystery in this series by Will Thomas. It is 1885, and London has experienced a massive influx of foreigners. They have come to better their lives. Though most immigrants are legal, many of the Italians and Sicilians are not. Some are members of the Italian Camorra under the leadership of Victor Gigliotti, a wealthy restaurateur. Others are members of the Sicilian Mafia. The leader of this group, though to be Marco Faldo, is unconfirmed. It has been rumored that these two factions will face each other in a battle over control of the docks where many lives will be lost, undoubtedly including some innocent bystanders. Barker and Llewelyn are hired by the Home Guard to squelch these battles and find irrefutable proof of the leadership of these groups. They will receive no help from the Scotland Yard or the local police force, although if they succeed it will be Scotland Yard which gets the credit. When Barker receives a "black hand" note himself he knows the meaning: "Your days are numbered. I am the eraser that will wipe away the chalk mark of your days." Barker and Llewelyn must assemble their own group of men to covertly work with them to break up these groups. Knowing the enemy will be well armed and with no outside financial help, Barker must call in a few debts to obtain the resources he needs for this difficult task. The author paints a vivid picture of Victorian London that suits both the colorful characters and the intricate plot well. With murders, secret organizations, false identities, and even Barker's somewhat mysterious trip to the south of England, The Black Hand is a captivating mystery that will keep the reader's attention right up to the exciting conclusion. Special thanks to guest reviewer Betty of The Betz Review for contributing her review of The Black Hand. Acknowledgment: Touchstone provided a copy of The Black Hand for this review.